But it’s what the blockchain doesn’t have that makes it controversial, and prone to giving venture capitalists greedboners. Bookkeeping tools generally require a bookkeeper, but with the blockchain, there is no head honcho bookie. It’s a decentralized, crowd-powered spreadsheet, relying on cryptography instead of a central authority. Fervent crypto-enthusiasts, never ones for ambivalence, say the blockchain technology Satoshi Nakamoto created to fuel Bitcoin has genuine potential to tip power dynamics in banking, politics, the internet, and everywhere authorities, well, authorize things. Critics see it as either hopelessly impractical or a fast-track to a merciless, anarchic hellscape. Nakamoto’s blockchain math is a solution to a famous game theory puzzle called the Byzantine General’s Problem, in which old-timey army officers are planning an attack, but they’re worried about traitors lurking in their midst. Trust no one! But, of course, an army needs to communicate to launch an attack. So the General needs to find a way to pass a message along that cannot be sabotaged. This is where the blockchain comes in. Every single time you make a transaction on the blockchain, that transaction is sent out to many nodes in the Bitcoin network. Basically, everybody participating in the Bitcoin process also has copy of that ledger and can check it for inconsistencies. It’s a distributed ledger. The order of transactions is also verified by a cryptographic process that relies on the combined computational power of the crowd. So if you try to pass off a fake exchange, you’ll get caught — because your fellow Bitcoin users can trace every alteration and exchange that goes down. There are different kinds of blockchains, with varying degrees of complexity, so the math underlying the crypto is always different. But the general principle—a decentralized group of machines capable of verifying transactions—is the same. The idea of a distributed ledger is not new, but Satoshi put a spin on it — community members are incentivized to verify transactions because they earn Bitcoins for their efforts. People who are already “mining” Bitcoin are selected to have their machines join the blockchain and verify that nothing fishy is going down. Bitcoin “miners” use computer power to solve puzzles; if they correctly solve a puzzle, they get Bitcoin as a prize. To make blockchain technology work, the Bitcoin community needs Nakamoto’s clever incentive program. If you want to mine Bitcoin, you have to use a sliver of computational power to verify the blockchain when your turn comes up. The rules of the blockchain are baked into the mining software to make sure miners will check the ledger when it’s their turn. 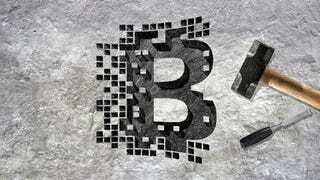 With Bitcoin, blockchain technology is used to transfer money. But it has the potential to do a lot more: it will work for any process of verification, really, and can even be used as a communication tool. This is why companies, investors, and crypto diehards are starting to see potential uses for blockchains all over the place. True believers say blockchain technology could revolutionize voting systems and make notaries and banks redundant, although they’re still in the theoretical stages of spinning their ideas into reality. The tech is nowhere near ready for such widespread and intense application. But companies are working to steering this technology away from the crypto fringe. IBM and Samsung are already developing a blockchain-powered backbone for Internet of Things products called ADEPT. These companies are taking the core ledger concept and spinning it out into a way to help devices communicate cheaply. Other projects, like Ethereum and Ripple, take the idea of the blockchain and also spin out the concept for a wider array of applications. Enthusiasts rattle off a vertiginous list of spin-off uses: microfinance, vehicle registration, gun permits, wills, genome data, report cards, DRM—all bandied about as stuff that’d be more secure if blockchains were used to verify them. ADEPT is still in very early stages, and it uses a more complicated cryptography than the OG blockchain, but it’s an example of how established corporations are attempting to capitalize on the concept. And, as with all new technologies with grand intentions, there are plenty of startups hovering. Namecoin is basically a blockchain-powered alternative to ICANN’s (crappy) domain registry system, and it plans to provide notary services in the future. Van Valkenberg especially likes BitMesh, a blockchain startup that wants to help people sell their extra bandwidth by establishing mesh networks that’d serve as local marketplaces and alternatives to only using big ISPs, and it’s easy to see why: If BitMesh can make its concept a reality, it’d give people a better, cheaper way to share internet costs. There is a reason why people use banks, hire lawyers, and get notaries to make sure their documents are legit. Society is organized around the idea that there are authorities that can be trusted. And yeah, people are fallible and companies regularly have huge security breaches using current models. But evacuating authority from central figures and relying totally on a mathematic solution developed by a pseudonym who is more a symbol than a person is also rather terrifying. That isn’t to say that the projects blockchain supporters are working on can’t succeed, or shouldn’t succeed. They are looking for better ways to make things known to be true; in the idyllic blockchain-managed world, we would inhabit a world where fraud was impossible. But it’s just important to note how much faith that world places in machines over humanity.